One of the most maligned spiritual gifts is prophecy. It is either dismissed as being obsolete or it is approached so casually that it is not surprising many people have convinced themselves that it is obsolete. An example of how little REAL respect is given to prophecy is being demonstrated as I write. A prediction has been made of yet another catastrophe in Christchurch New Zealand. That city seems to draw attention from a sector of the “church” which delights in the idea of God pouring out His wrath on other people. Christchurch seems to be a favourite target for a few reasons. It has already been the victim of disaster and its name makes it a handy metaphor for those critical of the state of the church. Put the two together and we have God showing His displeasure with Christ’s church. The current prediction has been very specific – giving today as the day when terrible things will happen again to the city. It has had a polarising effect within the Christian community. Some reject it out of hand because they reject the validity of all present day prophecy. Others have embraced it without question, appearing to take delight in the idea of God’s judgement being demonstrated against others. I take a different view. I am totally accepting of the validity of prophecy today but I strongly reject this particular prediction. I find nothing in it to indicate it is a true prophetic word. Yesterday, 27th September, I resigned from my role as the moderator of a Christian forum because of the way this prediction was being addressed. As a result I have been asked not to contribute to that forum for three months. It is clear that the forum owner accepts the validity of the prophecy in part. The only aspect that troubles him is the dating of the predicted disaster. A few other members have been more supportive, accepting all of it as a true message from God. They expect disaster to strike Christchurch today. Maybe even more disturbing than this expectation is the impression that they won’t even have their certainty shaken when the predicted event fails to happen. They will merely latch onto the next “word of prophecy” and run with that one until it also fails. 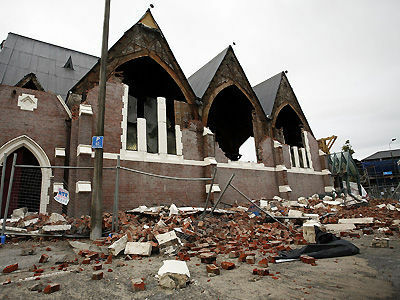 These people are more than willing to see Christchurch take the brunt of God’s wrath because of the state of the church (as they see it) and yet they are blind to the fact that THEY are no less disobedient, wilful and misled. They are no less guilty of error and stubbornness –all demonstrated by their refusal to test the “prophecy” according to God given, scriptural principals. Prophecy is something that we can not afford to take lightly. We can not be casual with it. In the Old Testament false prophets were given no leeway. According to God’s instructions, they got it right – or they lost their lives. Today false prophets are not faced with stoning. Some may see this as God’s mercy at work. I see it slightly differently. Maybe the Old Testament way was more merciful – it made people more aware of the seriousness of saying “God said” when God had said nothing of the kind. Maybe the freedom for “prophets” to speak without immediate consequences is itself a judgement on the church, separating the wheat from the chaff, separating those with a love and desire for the the truth from those who prefer baseless sensation. There are still several more hours of the 28th (NZ time) to go. As yet I’ve heard no news of destruction in Christchurch. I’ll stick my neck out a little right now and say the rest of the day will pass with a similar absence of news, and then tomorrow the excuses, self-justification and back tracking will begin: anything to avoid accountability for the lies that have been promoted and supported. My daughter sent me an email two days ago, telling me there were many signs pointing to September 28th as the day of Rapture. She mentioned it because I was asking if I could come visit the weekend of Nov 11th. She said of course, but felt she needed to tell me what her church was telling her about September 28th ...I guess in case Nov 11th was too late because of the Rapture? I do believe in prophecy today, but I think it's rare and I don't think we are to know the day or the hour when the Lord comes. I told her that I would plan to drive over to her place on November 11th. If her church is right and the Rapture happens before then, well I won't have to worry about driving anywhere and we won't be thinking about anything but worshiping the Lord. When you spoke about the "cover-up" or denial in you last post, as to what those will do should this prophecy not come to pass, I thought of walking in delusion. That's not a good thing, being in a state of delusion. I hadn’t previously been aware of rapture predictions associated with the 28th. However, by referring to scripture we can be sure that all dated predictions about the rapture will be false. No one knows the hour or the day (Matt 24). We also know that it will not occur prior to the arrival of the man of Lawlessness (see 2 Thess). Also scripture makes it clear that the “rapture” will not occur until the dead in Christ have risen.1 Thess 4. The responses so far have been varied. Some have apologised and confessed to their error. Others are avoiding personal accountability by blaming a corporate failure of discernment. I have also seen how the “prayer averted the tragedy” response is also being used. One of the overlooked aspects is the harm done to the woman who made the prediction. Widespread acceptance and encouragement of her false prediction did nothing to help her be shown the truth before it became too late. Now how many of those who embraced her word will stick around to help her deal with the aftermath? I think you were witness to some of it. But... the truth is the truth. Stop over to the blog below. You'll find no such bridling of truth there. From the quick glance I've had at that blog I would not recommend anyone to go there. There may be some good things - but there is too much bad mixed in to give that site any value. "Maybe the freedom for “prophets” to speak without immediate consequences is itself a judgement on the church, separating the wheat from the chaff, separating those with a love and desire for the truth from those who prefer baseless sensation." This really has gotten me thinking, because I know God is in control of this whole 'affair' and I am starting to see a bigger picture that I think you have had some real insight into...thanks. Hi Gramma, I think we are all learning new things through this. God can even turn the bad around to bring about good for His purposes. Yes amen He truly is a wonderful Father! The sister who runs that blog is truly seeking the truth. There is so much more to the errors of Calvin and Luther than one could possibly imagine. But Menno was also wrong.. And Arminius.. Throw in a little C.I. Scofield dispensationalism backed by... well research it... and it leaves 95% of the mainstream western church entrenched in some sort of greivous error or outright heresy.. The western church says "give us Tim Lahaye and John Hagee and that guy that says killing is ok in some circumstances...."
I'm the kind of guy that likes to get to the bottom of things. To know who did what and for what reason. In the process, I've found out alot of ugly things that the so-called heroes of the early church did and I'm not afraid to speak of them. Murderous Luther and Calvin are just the tip of the iceburg. And yes, secret societies are actively seeking to destroy Christianity. Could You Become False Prophet or Teacher?